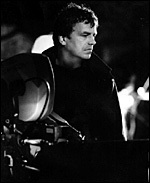 Neil Jordan was born in County Sligo, Ireland and educated at University College, Dublin where he studied Irish History and English and founded the Irish Writers' Co-operative. He published a volume of short stories, Night in Tunisia, that won the Guardian Fiction Prize in 1976, and has since published three novels: The Past (1979), The Dream of a Beast (1983) and Sunrise with Sea Monster (1994). After working as script consultant on John Boorman 's Excalibur in 1981, Jordan made his feature debut with Angel (1982), which dramatises the experiences of an Irish saxophonist ( Stephen Rea , in the first of many roles for Jordan) who witnesses the murder of his band manager and a young woman and determines to wreak revenge. Though made as a low-budget film for television, the surreal style of the film, its oneiric use of colour and lighting, and its poetic use of dialogue persuaded Channel 4 to distribute it theatrically. It established Jordan 's reputation as a director and led to a fruitful collaboration with distributor-turned-producer Stephen Woolley . Their first film together, The Company of Wolves (1984), reveals an important component of Jordan 's imaginative vision, the world of dream and fantasy. As in many of his subsequent films, he addresses history and politics, through images of horror, the gothic, the supernatural and the macabre. Mona Lisa (1986), Jordan 's next film, starring Bob Hoskins , Cathy Tyson and Michael Caine , is reminiscent of Pier Palo Pasolini 's Accattone (Italy, 1961) and Mamma Roma (Italy, 1962), in its focus on a world of pimps and prostitutes where the protagonist is the city and where politics emerge through the images portraying the economic and social relations of underworld life. Created in the style of the crime genre, with an homage to film noir, Mona Lisa reveals the complex ways in which Jordan 's films draw on existing genres and then transform them to suit contemporary contexts and issues. Mona Lisa was highly successful commercially and Jordan was invited to Hollywood, where he made two comedies, High Spirits (1988) and We're No Angels (1989). But both films were box-office flops and he returned to Ireland, where he wrote and directed The Miracle (1991), starring Beverly D'Angelo and Donal McCann . The film dramatises the coming of age of a young boy, Jimmy, who is tied to an alcoholic father (another saxophonist), but the conflict between the two is more than an Oedipal conflict between father and son. It is a clash of past and present and testifies to Jordan 's unrelenting engagement with Irish culture and society and the changing attitudes toward gender, sexuality and the family. Despite its consummate weaving of characters, images, sound into its multi-faceted motifs, The Miracle attracted little attention from critics or audiences. Thus the international success of The Crying Game (1992), a modestly budgeted film which echoes many of the themes and concerns of Angel , came as a complete surprise. Like many of Jordan 's films it involves romance, but here there is a twist on the normative heterosexual scenario. The oddness of the relationship between reluctant IRA gunman Fergus ( Stephen Rea ) and Dil ( Jaye Davidson ), the black girl/boyfriend of a British soldier whose death he is indirectly responsible for, fascinated audiences and critics and overshadowed Jordan 's other concerns with Irish nationalism and the role of the IRA . If The Crying Game marked a return to the Irish subject matter of Angel , Interview with the Vampire (US, 1994), based on Anne Rice 's best-selling novel and drawing on the talents of Tom Cruise , Christian Slater , Brad Pitt , Antonio Banderas , Kirsten Dunst (and Jordan's alter ego, Stephen Rea ), returns to the horror and fantasy of The Company of Wolves . It grossed $220 million in the international market, and demonstrated Jordan 's ability to explore serious philosophical issues within popular cinematic forms. In Michael Collins (US, 1996), centred around the 1916 Easter Rising which began the bitter and bloody war of Irish independence, Jordan came in for harsh criticism, not only from the predictably hostile English right-wing press, but from Irish sources too. Alan Rickman 's portrayal of Eamon de Valera , Ireland's first president, was considered particularly provocative and Sile de Valera protested at the film's misrepresentation of her grandfather. Jordan was accused by many critics of bending events to suit his political agenda. De Valera 's defiance of Collins in the Dail, his petulance, and his "nervous breakdown" shortly before the ambush where Collins is killed contribute to the film's discrediting of "Dev's" masculinity (as does his escape from Lincoln prison in women's clothes). But this is part of Jordan 's wider strategy of combating inherited cinematic images of Irish masculinity. Collins , "the Big Fella", ( Liam Neeson ) is portrayed as neither gratuitously violent nor sexually puritanical. Reinventing and inverting images of Irishness, Jordan associates him with intelligence, cleverness, and wit. Furthermore, he stresses purposeful action rather than indiscriminate violence on the part of the IRA . The scenes in Marsh's Library and in Dublin Castle with Broy ( Stephen Rea ) and Collins highlight the role that information and intelligence play in Collins ' strategy to defeat the British, and present the men as more than vicious "gunmen". Julia Roberts ' characterisation of Kitty Kiernan, serves to highlight Collins 's ambivalence over the use of violence but even more to accentuate the melodramatic sense of mourning and loss that subtends the entire film. In The Butcher Boy (US, 1997), Jordan uses a young boy as the focal point, thus circumventing conventional moral distinctions to create a compassionate - even humorous - view of a child murderer who chops a woman to pieces like a slab of meat, and casts the spectator adrift from clichés of childhood innocence. The increasingly unfamiliar character of the world seen through the child's eyes frustrates and confounds judgement. The spectator is treated to images of everyday life where everything is metamorphosed through recollection, dream, and fantasy. As he experiences loss after loss - his mother, his uncle, his father, and his friend Joe - Francie, the butcher boy, retreats to an inner and feminised world where he assumes his mother's domestic chores and wears women's clothes. In this fantasy world, he conjures up his own image of the Virgin Mary (played by Sinéad O'Connor , notorious for tearing up a picture of the Pope on television) and Jordan 's treatment of this most sacred icon of the Catholic Church signals an attack on its debilitating effects on Irish culture. The Butcher Boy is particularly self-conscious about the role of media in representing Ireland, incorporating television, films and radio into the fabric of the film as evidence of the modernisation begun long before Ireland's new-found economic prosperity. The television segments play a key role in undermining historical images of Irish familial and social life, introducing controversial subjects, particularly the threat of nuclear war. In fact, the dominating trope in the film is of explosion. Everything in this world erupts and becomes hallucinatory - images of landscape, family, childhood, sexuality, Catholicism, small town life, conceptions of sanity, and conceptions of cinematic realism and their debt to melodramatic representation. In this context, the film has no "resolution", shifting its burden of uncertainty onto the audience. In 1999, Jordan made two films, In Dreams (US), a psychological thriller starring Annette Bening , Stephen Rea , Aidan Quinn , and Robert Downey, Jr. , and The End of the Affair (US/Germany), based on Graham Greene 's novel about a passionate wartime affair suddenly ended for religious reasons. The obsession with nightmares and pernicious fantasies which dominates In Dreams might indicate that this was the more personal project, but The End of the Affair 's exploration of marriage, extra-marital sexual passion, and self-denial seems to have engaged Jordan more fruitfully. As he tried to explain: "I am drawn to stories where people do not fully understand the reasons for their actions and I don't know why that is. It's probably because I don't believe that people fully understand the reasons for their actions." Jordan 's most recent film, The Good Thief (UK/France/Ireland, 2002), is a reworking of Jean-Pierre Melville 's thriller, Bob le flambeur (France, 1956), with Nick Nolte taking the part of Bob Montaganet, gambler and drug addict. Fast-paced, with brilliantly photographed shots of the Riviera, The Good Thief focuses on images of the international underworld and the intricacies of survival in this milieu of robbery, romance, and male bonding. Like so many of Jordan 's films, it is both a reflection on the genre form and an allegory of contemporary global politics. The "good thief" is, as Bob tells Roger, his antagonist the policeman, "the man hanging on the cross next to Jesus who repented just before his death." Jordan 's diverse work to date as a director has brought new conceptions of Irish culture to international audiences and helped to create close ties between British and Irish filmmaking. Jordan 's movement between Britain, Europe, Ireland and the USA demonstrates the increasingly international nature of contemporary cinema. He is currently working on an Anglo-Irish/Italo-German historical epic, Borgia (2003). Coles, Robert, '1922 and All That: The Inner War in Features of Independence,' Historical Journal of Film, Radio and Television, August 2000. Jordan, Neil, 'Neil Jordan's Guilty Pleasures,' Film Comment, Nov-Dec 1992, pp. 36-39. MacSwiney, Seamus, 'Trying to Take the Gun out of Irish Politics: An Interview with Neil Jordan', Cineaste , vol. 32, no, 4, 1997, pp. 14-24. McIlroy, Brian, Shooting to Kill: Filmmaking and the 'Troubles' in Northern Ireland (Trowbridge, Wiltshire: Flicks Books, 1998). McKillop, James, Contemporary Irish Cinema: From the Quiet Man to Dancing at Lughnasa (Syracuse: Syracuse University Press, 1999). Pettit, Lance, Screening Ireland: Film and Television Representation. (Manchester: Manchester University Press, 1988).